Gallia Academy senior Katie Carpenter passes from the top of the wing, during the Blue Angels’ non-conference game loss on Saturday in Rocksprings, Ohio. Gallia Academy sophomore Koren Truance shoots a layup, during the Blue Angels’ 60-25 loss on Saturday in Rocksprings, Ohio. ROCKSPRINGS, Ohio — There just wasn’t much the Lady Marauders tried that didn’t work. 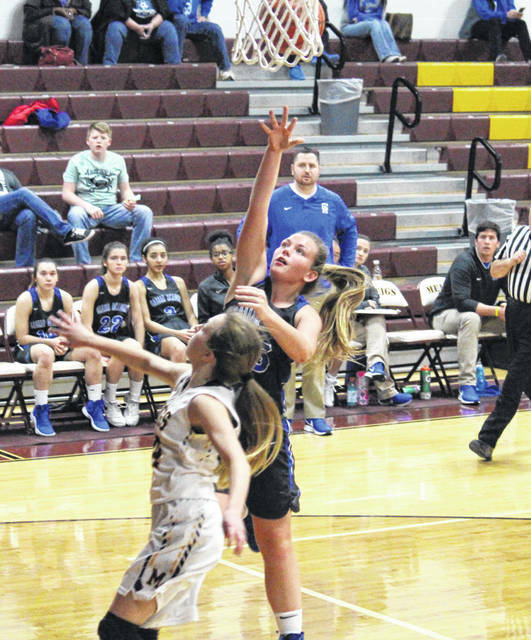 The Meigs girls basketball team defeated non-conference guest Gallia Academy by a 60-25 tally on Saturday in Larry R. Morrison Gymnasium, with the Maroon and Gold leading wire-to-wire. 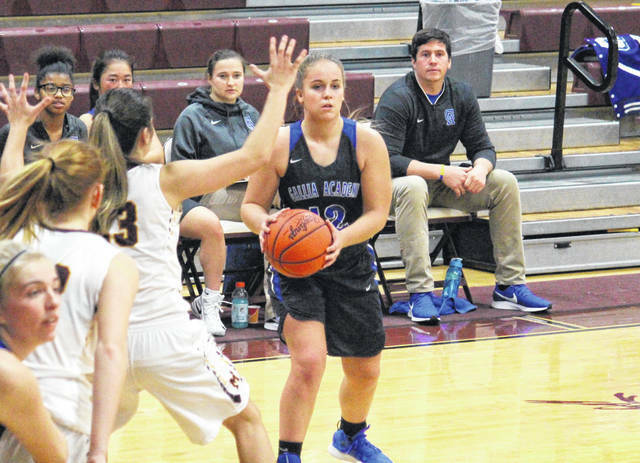 Meigs (5-1) — which didn’t commit a turnover in the first 14 minutes of play — held Gallia Academy (3-2) scoreless for over three minutes to start the game, getting out to an 11-0 lead. The Lady Marauders led 20-4 by the end of the first quarter, and then hit three consecutive three-pointers to open the second. The Maroon and Gold led by as many as 33 points in the period and took a 44-13 edge into the break. The hosts began the second half with a 9-0 run and led by a game-high 40 points with four minutes left in the third quarter. The Blue Angels scored the final eight points of the period, trimming the margin to 53-21 headed into the finale. The hosts capped off their 60-25 victory with a 7-to-4 fourth quarter run. Following the win, third-year MHS head coach Jarrod Kasun noted his team may be finally healthy, and the gameplan was well executed. First-year GAHS head coach Jordan Deel acknowledged that his team didn’t do what it took to win the game from the onset, but that things looked better after the half. In the win, Meigs shot 24-of-64 (37.5 percent) from the field, including 7-of-22 (31.8 percent) from three-point range. Meanwhile, GAHS was 10-of-38 (26.3 percent) from the field, including 2-of-9 (22.2 percent) from deep. At the free throw line, the Lady Marauders were 5-of-9 (55.6 percent) and the Blue Angels were 3-of-6 (50 percent). The hosts enjoyed a 39-to-27 rebounding advantage, including 20-to-10 on the offensive end. Collectively, the Lady Marauders had 16 assists, 15 steals, one blocked shot and nine turnovers. Gallia Academy recorded team totals of eight assists, five steals, two rejections and 22 turnovers. MHS senior Madison Fields hit a pair of three-pointers and led the Maroon and Gold with a double-double effort of 14 points and 12 rebounds. Becca Pullins scored 12 points on a quartet of triples, while Mallory Hawley finished with 11 points and seven rebounds. Fields and Hawley tied for a game-high with five assists each, while Hawley led the MHS defense with four steals and a rejection. 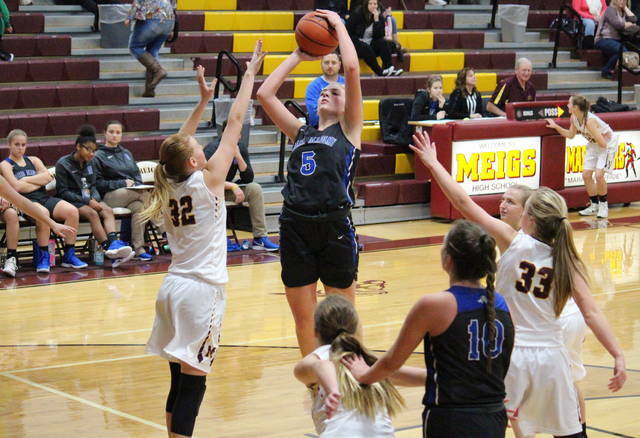 Kassidy Betzing scored eight points for the victors, Alyssa Smith added seven, while Jerrica Smith came up with four. Taylor Swartz and Marissa Noble capped off the winning total with two points apiece. GAHS was led by sophomore Maddy Petro, who marked team-highs of nine points, eight rebounds and two blocked shots. Hunter Copley knocked down one three-pointer and finished with seven markers, Koren Truance added four points, while Junon Ohmara earned three points with a trifecta. Arianna Jordan completed the guests’ tally with two markers. Copley, Truance and Abby Cremeans had two assists apiece to lead the Blue and White, with Cremeans coming up with a team-best two steals. Meigs — which began the week with its only loss of the year, a 67-63 decision at Vinton County — has won all-5 of its other games by double digits. Kasun talked about the game with VCHS not being a true setback for the Lady Marauders, because both teams played great basketball. After back-to-back losses, Deel is looking for his team to get back to its winning ways with better offensive execution, as well as turning defensive stops into fast break opportunities. After the Lady Marauders host Alexander on Monday, MHS will head to River Valley on Thursday. Following their trip to Coal Grove on Monday, the Blue Angels will be home on Thursday to welcome South Point.